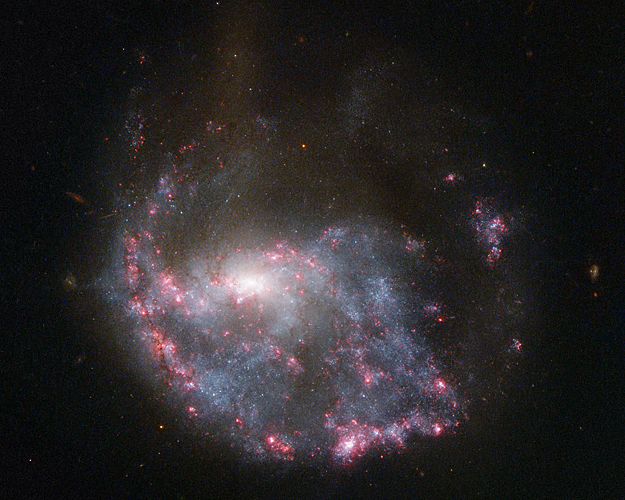 Bright pink nebulae almost completely encircle a spiral galaxy in this NASA/ESA Hubble Space Telescope image of NGC 922. The ring structure and the galaxy's distorted spiral shape result from a smaller galaxy scoring a cosmic bullseye, hitting the centre of NGC 922 some 330 million years ago. In Hubble's image, NGC 922 clearly reveals itself not to be a normal spiral galaxy. The spiral arms are disrupted, a stream of stars extends out towards the top of the image, and a bright ring of nebulae encircles the core. Observing with NASA's Chandra X-ray Observatory reveals more chaos in the form of ultraluminous X-ray sources dotted around the galaxy. NGC 922's current unusual form is a result of a cosmic bullseye millions of years ago. A smaller galaxy, catalogued as 2MASXI J0224301-244443, plunged right through the heart of NGC 922 and shot out the other side. In wide-field views of the NGC 922, the small interloper can be still be seen shooting away from the scene of the crash. The chances of seeing one of these galaxies nearby is therefore quite low. Despite the immense number of galaxies in the Universe, this is one of only a handful known in our cosmic neighbourhood (the Cartwheel Galaxy, see potw1036a, being the most famous example). Observations of the more distant Universe (where we see further into the past) show that these rings were more common in the past, however.